I'm no longer able to review the comics magazine Mineshaft. I just sort of stare at it now, a big, dopey look on my face that likely encompasses admiration for what I'm guessing is an arduous assembly process and a worry too deep to give full voice that with any issue the whole affair could become too much to sustain and dissolve forever into a messy pile of paper, staples, memories and ink. This piece is less a review than a plea for you to buy Mineshaft, or if you remember this piece in some dim way at some future date to at least to pick one up if you ever see one, hold it in your hands and look it over, and maybe consider buying it at that point from whatever great person has in this day and age purchased some to sell to others. Some variation of what follows has been said many times now, but Mineshaft feels like the last, lonely effort for an entire school of comics that grew out of the undergrounds: socially- and self-aware comics- and image-making that values in equal amounts the judicious application of illustrative craft and standing at cross-purposes with the thrust of American culture. Mineshaft does almost nothing to discourage a romantic reading of its content. 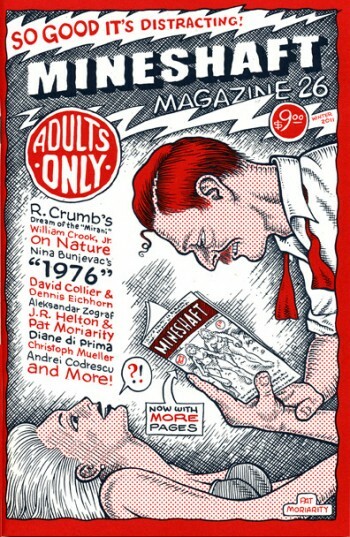 It's a 'zine, really, but one that runs sketchbook images from Robert Crumb, and publishes comics from Aleksandr Zograf and the team of Dennis Eichhorn and Dave Collier, and that sports to die for imagery from Christoph Mueller and William Crook, Jr., and that runs letters from many of its contributors and quite a few of their friends and peers. It's sort of like a party near water, its patrons dressed up and barefoot, everyone ready to take a boat to god knows where. Issue #26 seems like a bigger issue than past efforts, and while it never feels bloated Mineshaft shares a curse that even the better underground comix evinced, a negative quirk that might be more effectively enabled the higher the page count. A small percentage of the work between its covers feels dashed off, almost willfully unnecessary. Some of the cartoonists working in this tradition, particularly those that came after the underground era, occasionally make comics as if nailing down the right tone or getting onto paper some approximation of a visual facility strictly defined is enough to recommend a work. There are indeed a few such second-tier pieces in this latest effort, although nothing that takes up enough space to shatter the overall spell. My favorite piece in this 26th issue was an article with prose and illustrations both by William Crook, Jr. on his drawings of landscapes and nature scenes. Crook, Jr. talks about certain visual elements unique to the American Midwest and the compulsion that makes him put some of them down on paper. So much of what's been great about cartooning the last 20 years has been the second coming of cartoonists that feel themselves part of a Midwestern tradition. It could be that Mineshaft will take on the burden of pointing that out, too. Magazines may be dying, but the only ones we should mourn are those that still have much to teach before they finally fade away.